We have a Maruti Swift VXI which has a K series engine. 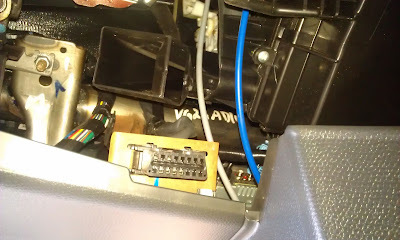 Here's a photo of the OBDII connector located on the left inside of the dashboard panel under the steering wheel. Do not yet know what all one can do with it. I would like to buy OBD2 Bluetooth device available on ebay and other sites, but i am not sure that weather Maruti Swift VXI 2011 (K-Series) model will support it. Please advise if you have any idea. Because some where i read that Maruti doesn't support. This is the particular system which enables detection of errors in cars. Actually the http://www.med-obd.com/obd2-connector-c-129.html is backed by sensors which indicate any kind of malfunction in your car. Needless to mention, the mechanic finds it easier to detect problems in your car with the help of the Obdii Cable. The OBD scanners, in general, can scan the following problems in your car.